Once we have resolved the cross of the first face of the Rubik’s Cube, we should solve the rest of the first face putting the corners into their position one by one. 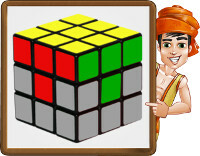 We shouldn’t place them wherever we want to because each corner has a determinate position in the Rubik’s Cube. In a similar way as in the previous step, we follow these solutions. Take into account that you will have to repeat this step four times, one for each corner. 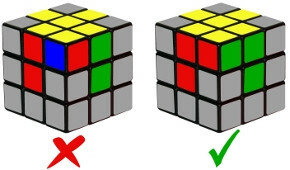 Hold the Rubik’s Cube in a way in which the yellow face is the top one, and the white face the bottom one. Search in the bottom layer for a corner with yellow on it. Pay attention to the three colors in each corner. If you can’t find any, go down to the “There is not any yellow corners on the bottom layer” section. Rotate the bottom layer until such corner is ‘underneath’ its position. If there’s no yellow corner in the bottom layer of the Rubik’s Cube it is because they are in top layer but out of their places. Follow this solution to move the corner to the bottom layer. Then, apply the correspondent solutions depending on the case. What does “+ Repeat Step 2” mean? Repeat this step for each corner until you solve the first layer of the Rubik’s Cube. Now it’s time to see the solutions to build the second layer. To solve this step, you do not need to solve a face, but a layer (the face and the lateral colors). You will need to repeat this step again (and maybe also step 1), but paying attention to the lateral colors of each edge.